Obituary – Allen, Mary Louise (Shoop) « Perry High School Alumni Association, Inc.
– daughter of Mr. and Mrs. Harry V. Shoop, was born in Perry in 1921 and has gone to Polo and Perry schools all her life. In high school, she was vice president of the glee club, vice president of her home room. a member of the senior play and in the cast of the operettas. She likes to read and is uncertain about her future. Mary Louise Shoop Allen, 72, of rural Noble county, died Tuesday, Oct. 19, 1993, at Kenwood Manor in Enid. Funeral will be at 2 p.m. Friday at the First Christian church of Perry. Rev. Joe Samuels will officiate. Burial will be in the Polo cemetery under direction of Brown Funeral home. Memorials may be made to the First Christian church renovation fund. Mrs. Allen was born July 14, 1921, on the farm claimed by her grandparents, Grant and Nancy Miller Shoop, in the Run of 1893. She was the daughter of Harry and Iva Scott Shoop. She attended Polo rural school and was a 1939 graduate of Perry high school. She was a member of the high school glee club and the Order of Rainbow for Girls and was active in 4-H as a member and leader. On April 21, 1940, she.and Richard Nawayne Allen were married in the home of her parents. The couple lived on their farm in the Polo community until Mrs. Allen became ill.
She was an active member of the Polo Christian church where she served as a Sunday school teacher and was involved in other activities. 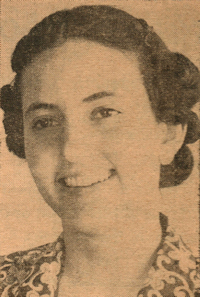 When the Polo church disbanded, she became a member of the First Christian church of Perry where she was active in the choir and Christian Women’s Fellowship and served on various committees. In addition to her husband, Mrs. Allen is survived by one son, Richard, of Billings, a daughter, Barbara Addison, St. John, Kan.; a son in-law, Conall; and two granddaughters, Andrea and Alicia Addison. She was preceded in death by her parents, an infant daughter, Paula Elizabeth; and one brother, Harry Joe Shoop.